Whitman (above) wasn’t much of a drinker, but he hung out at Pfaff’s almost every night from 1858 to 1862. The ringleader of the coterie was Henry Clapp, founder and editor of the Saturday Press, a cranky, short-lived magazine that brought Mark Twain national fame by publishing his story about the jumping frog of Calaveras County. It was after Whitman’s work appeared in the Saturday Press that Thayer & Eldridge, run by two men in their 20s, reached out to Whitman. He had written 100 poems subsequent to self-publishing “Leaves of Grass” and was ready to publish an expanded edition. 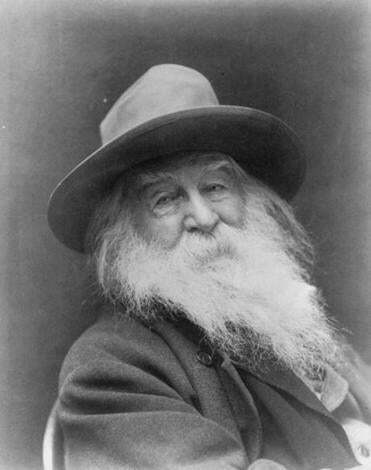 Whitman moved to Boston to oversee the printing of his book, selecting typefaces and dictating the spacing between words. At one point, Ralph Waldo Emerson showed up at the publishing house. He failed to persuade Whitman to cut some of the bawdy poems. The third edition of “Leaves of Grass” brought Whitman scathing reviews — the Boston Wide World called it “the veriest trash ever written” — as well as recognition of his unconventional literary talent. Poets Dan Chelotti and Thera Webb will join Harvard professors Stephen Burt and Jorie Graham and former US poet laureate Robert Pinsky in a reading from the book at 7 p.m. Sept. 22 at Harvard Book Store.